Facebook could become a threat to democracy without tougher regulation, the former head of intelligence agency GCHQ has said. 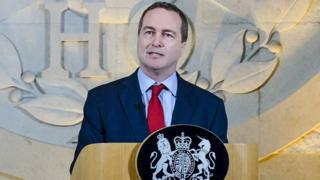 Robert Hannigan told the BBC the social media giant was more interested in profiting from user data than “protecting your privacy”. It comes after MPs this week accused Facebook of striking secret deals over user data. The firm has also been criticised for its handling of fake news. In an interview with BBC Radio 4’s Today programme, Mr Hannigan said: “This isn’t a kind of fluffy charity providing free services. It’s is a very hard-headed international business and these big tech companies are essentially the world’s biggest global advertisers, that’s where they make their billions. Asked if Facebook was a threat to democracy, Mr Hannigan said: “Potentially yes. I think it is if it isn’t controlled and regulated. Emails written by Facebook’s chief and his deputies show the firm struck secret deals to give some developers special access to user data while refusing others, MPs said earlier this week. The Digital, Culture, Media and Sport Committee published the cache of internal documents online as part of its inquiry into fake news. It said the files also showed Facebook had deliberately made it “as hard as possible” for users to be aware of privacy changes to its Android app. But Facebook said the documents had been presented in a “very misleading manner” and required additional context. Mr Hannigan also downplayed concern about the Chinese telecoms company Huawei after its chief financial officer was arrested in Canada this week. The charges have not been made public but are believed to relate to the company’s violation of Iran sanctions. However, there are concerns that China uses Huawei technology for spying and some countries have barred its equipment from their 5G mobile networks. He said no “malicious backdoors” had been found in Huawei’s systems, although there were concerns about the firm’s approach to cyber security and engineering. “We all know what that leads to but that is incompetence not malice,” he said.